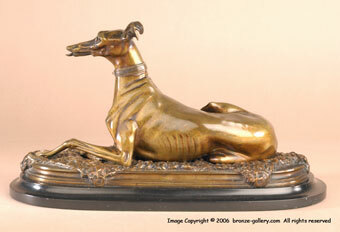 Waagen must have been very fond of Whippets and Greyhounds since he did many sculptures of them. He created several groups of Greyhounds or Whippets, one playing with a Persian cat, another playing with a King Charles Spaniel, and his graceful Whippet looking at a Butterfly. This fine model of a Greyhound or Whippet reclining on a fur rug that hangs over the edge of the base is not signed but it is typical of the fine detail he put into his sculptures. 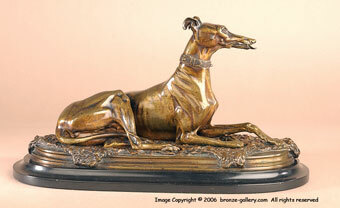 It is a card holder and the Greyhound has a moveable jaw to hold a card. The bronze has a warm mid brown patina and is mounted on the original black slate base. A beautiful and graceful composition, it is a very fine cast and a rare model that would be enjoyed by any sighthound owner.